LUDLOW, Mass. – Daniel Kraynak’s successful penalty sent Greater Binghamton Thunder FC (NPSL) on to the second round of the U.S. Open Cup tournament after beating Western Mass Pioneers (PDL) 1-1 (4-3 on PKs) on Wednesday at Lusitano Stadium. After Thunder keeper Jason Stenta made his second penalty stop, Kraynak sent his shot left, where it deflected off the fingertips of Pioneers keeper Nick Zucco and fell into the back of the net to seal the first round result for the guests. The match went to penalties after Thunder midfielder Zebulun Cross’ 53rd minute strike canceled out Ryan Taylor’s 24th minute goal. Western Mass finished with 10 men after Kyle Tomas received his second caution in the 57th minute. With the win, the Thunder will face fellow Empire State squad the Rochester Rhinos on May 20 at Sahlen’s Stadium. Although the guests prevailed in the end, it was the hosts who opened the scoring midway through the first half. With the Pioneers pushing forward, Zach Grady sent a cross to Taylor, who put it through in the 24th minute. But not long after Taylor’s goal, an experienced Thunder selection started to make some headway of their own. Using the right flank to great effect, the guests nearly pulled one back right before halftime when Jacob Sutherland sent a low drive toward Zucco, who scooped it up and smothered it in the 44th minute. Persistence eventually paid off for Greater Binghamton not long after the break. Sutherland sent a pass into the box for Cross, who poked it through to level the match in the 53rd minute. Not long after Cross’ equalizer, the Pioneers dug themselves into a hole after Tomas was sent off after receiving his second caution. With only ten men for the duration, the hosts went with a 4-4-1, looking to find the go-ahead on a well-timed counter. While that was taking place, the Thunder busied themselves by building out of the back and putting the Pioneers under siege. Slavisa Ubiparpovic curled a dangerous cross for Patrick Thompson in the 64th minute, but Zucco stood firm. Cross made a bid for the game-winner in the 78th minute on a long-distance blast that briefly gave Zucco some trouble. But the Pioneers’ keeper quickly recovered the rebound, and the match went to extra time not long after. Western Mass made its intentions known early on in the first period of extra time by stationing nine players in the final third. Down a man, and tired legs abound, the Pioneers were clearly looking ahead to penalties. Greater Binghamton, to its credit, tried to permeate the defensive shell. Substitute Lucas Heffron found no fewer than three opportunities to grab the game-winner in extra time with 97th minute shot that required a reaction save from Zucco, and a pair of long-distance blasts veered just off target in the 115th and 120th minutes. 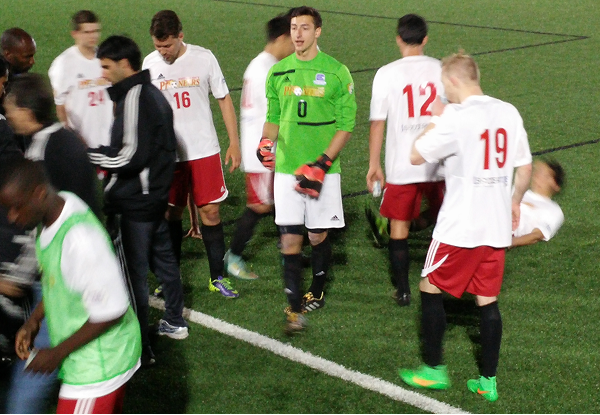 With the match knotted at 1-1 at the end of 120 minutes, the spotlight fell on Zucco and Stenta with penalties on tap. Stenta stopped Tyler Carlos and Marcelo Cunha on the Pioneers’ second and fifth tries, while Zucco denied Sutherland. Moments after Cunha’s effort was stopped, Kraynak converted to send the reigning Keystone Conference champions to Rochester for the second round.